After the movie, Michel Boujenah, the film-maker (who is also a very famous humorist) invited the young actress in the film to play the theme of “Schindler’s List” on her violin for the participants. The audience was very moved, and gave her a standing ovation! Dr. Sydney Ohana, Past President of Hadassah France, called for donations to replace the trees around the Hadassah Medical Center that have been destroyed in the terrible recent fires. The movie preview was followed by a lovely cocktail party where people had the opportunity to talk to Michel Boujenah. Messages of congratulations and appreciation for the event have been flooding the Hadassah France office! * The film was moving, fresh and very enjoyable. It is the “love story” between 2 kids aged 13-14. Victor is very smart, but doesn’t like school. 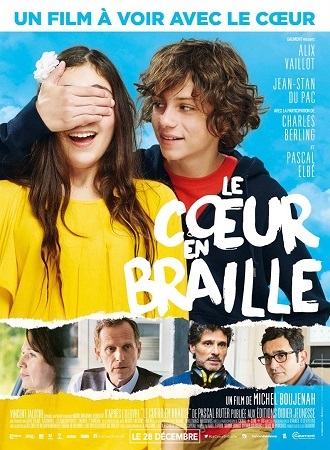 Marie is good at school and excels on the cello … but she has a disease that is causing her to go blind. Victor will do everything possible to help her so that nobody will realize that she is losing her sight. Thanks to him she will pass the exam for the Higher National Conservatory for Music.